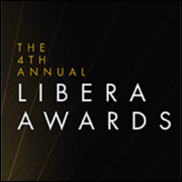 NEW YORK (Hypebot) – The independent label community gathered at the Highline Ballroom in NYC last night to celebrate a year of achievements by the Independent music community at A2IM’s fourth annual Libera Awards ("The LIBBYs") hosted by comedian John Ross Bowie (The Big Bang Theory, Curb Your Enthusiasm). Mass Appeal’s Run the Jewels and High Top Mountain/Thirty Tiger’s Sturgill Simpson each took home two LIBBY awards; Run the Jewels nabbed “Groundbreaking Album” and “Marketing Genius,” while Sturgill Simpson took home “Breakthrough Artist” and “Heritage Album” awards. The Label of the Year awards went to Ghostly International for small label (5 full-time employees or fewer) and Sub Pop for large label (6 full-time employees or more). Alligator Records Founder/CEO and 2014 A2IM Lifetime Achievement Award winner Bruce Iglauer presented Patricia Chin, VP Records Co-Founder/CEO, with the A2IM Libera Awards Lifetime Achievement Award for her 50+ years as an indie advocate.